In a pilot environment running VMware Integrated OpenStack (VIO) v3.0, one of the ESXi management nodes experienced a network isolation event. As a result of the event, vSphere HA responded accordingly and began restarting the VMs on the isolated ESXi node onto other ESXi nodes. The isolated ESXi node happened to have the secondary VIO controller VM on it. When the VIO controller VM was restarted through vSphere HA on the new ESXi node, the operating system came online quickly. However, the vRealize Operations dashboard for OpenStack still reported the services in critical status. Note: The following blog post is only relevant to VMware Integrated OpenStack deployments. 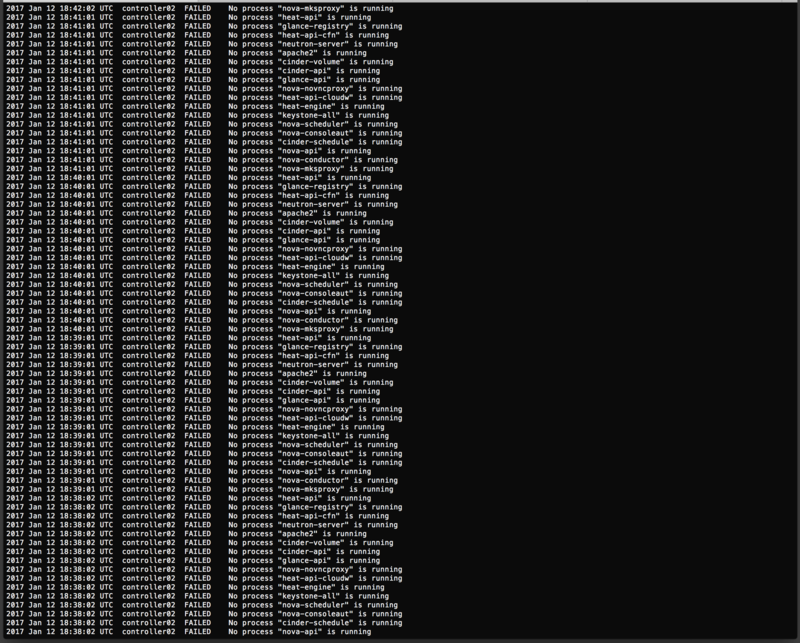 When I logged into the secondary OpenStack controller VM, I noticed there were no OpenStack services running. That’s not good. Digging in a bit deeper, I logged into the VIO management VM and ran a viocli command to check the status of the environment to see what other issues may be in existence. It just so happens that this is expected behavior in the current VIO release when a vSphere HA event occurs. I wouldn’t classify that as ideal at all, but it’s software and sometimes we have to workaround limitations. In order to restart the services of the secondary controller VM, there are a two options. Restart the entire OpenStack management stack. Restart just the affected controller VM. Both require use of the vSphere Web Client with the corresponding VIO plugin. Select the broken management VM and select the ‘All Actions’ drop-down menu at the top. Follow it up with selecting ‘Restart services’. A small pop-up window will appear verifying this is the action you wish to take. Once the services are restarted the entire OpenStack management stack should once again begin functional. One caveat worth noting, if the services have been stopped on the database nodes the restart of a single management VM through the UI may not re-establish the entire stack and a complete restart of the entire stack may still be required. The vRealize Operations dashboards can play an integral part of a VMware Integrated OpenStack environment, allowing the services to be monitored remotely. The previous post discussed the use of the vRealize Operations Management Pack for OpenStack and Endpoint Agent in order to provide detailed service-level monitoring within an environment. The management pack comes with nearly 200 pre-defined alerts for OpenStack that can be leveraged to understand what is occurring within the environment. As I’ve gone through the alerts, these are the key alerts that can be leveraged to understand when any of the OpenStack services are experiencing a partial or complete outage. Use of these alerts will help the environment be ready for a production deployment where an SLA can be attached. Enjoy! 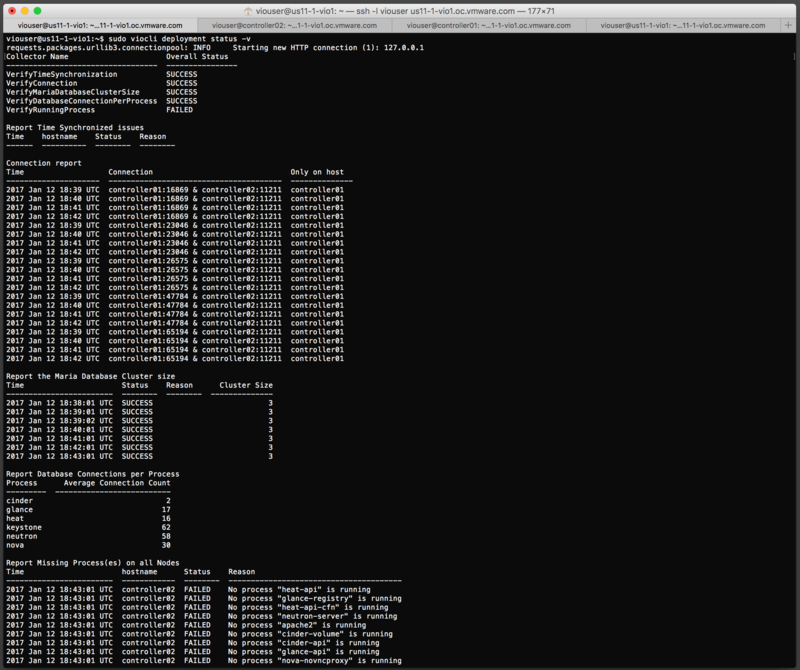 Being able to monitor OpenStack is key when running a production private cloud. Fortunately, VMware has provided several tools for monitoring OpenStack — specifically VMware Integrated OpenStack — when deployed in a production environment. If your environment is already leveraging vRealize Operations, there is a management pack for OpenStack and NSX that when used together will provide dashboards and pre-defined alerts for OpenStack. 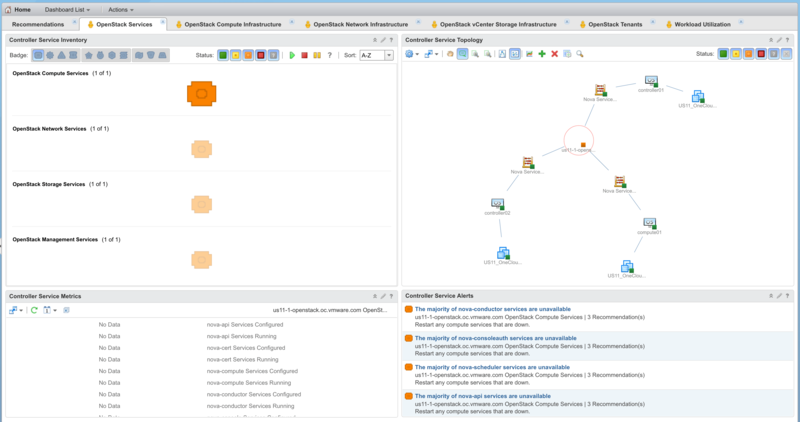 Available on the VMware Solution Exchange website, the vRealize Operations Management Pack for OpenStack provides integration between vRealize Operations and VMware Integrated OpenStack. The management pack includes several pre-installed dashboards, collecting data through the native OpenStack APIs. The management pack requires the vRealize Operations Management Pack for NSX also be installed, to correctly gather data related to the OpenStack Neutron service. The management pack includes the following dashboards which can be leveraged to gain a deeper understanding of the OneCloud OpenStack environment from an operations standpoint. The OpenStack Services dashboard displays the status the of the OpenStack services running on the VMware Integrated OpenStack management virtual machines. The vRealize Operations monitoring capabilities can be enhanced when the Endpoint Agent for OpenStack is installed on the OpenStack management virtual machines. As stated in the vRealize Operations Management Pack for OpenStack documentation, the Endpoint Agent can monitor the following services and displaying their status in the vRealize Operations OpenStack Services dashboard. The VMware Integrated OpenStack OMS virtual machine provides an automated installation workflow for the Endpoint Agent on each of the management nodes. The workflow can be leveraged post-deployment to facilitate the installation of the required Endpoint Agent package on the local operating system. Further details on the exact process of installing the Endpoint Agent (epops) can be viewed here. Having these pieces of software included in your environment will help ensure the monitoring of the services and the capacity within an OpenStack cloud is being taken care of correctly. Of course there are other tools that can be leveraged as well, however I have found these to be extremely useful within my vSphere environments. The blog post tomorrow will be an overview of the alert definitions the vRealize Operations Management Pack for OpenStack includes.